The Florida Chapter of The Wildlife Society is seeking nominations for the Paul Moler Herpetological Conservation Award. 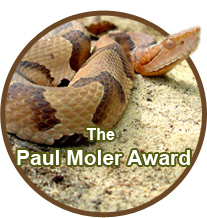 The Paul Moler Herpetological Conservation Award was created in 2006 to recognize individuals who have demonstrated excellence in the field of amphibian and/or reptile conservation. Achievements can be related to research, management, administration, or education. The person considered for this award does not have to be a member of the Florida or parent chapter of The Wildlife Society. Nominations will be accepted each year, but an award may not be conferred annually. Nominations received by December 1 will be considered by the Awards Committee and the Executive Board of the Florida Chapter of The Wildlife Society during its regularly scheduled Winter Board Meeting. The Awards Committee and Executive Board, acting as the Selection Committee, may confer a maximum of one award per year, to be presented at the Spring Membership meeting. Nominations will not be carried over from one year to the next, but may be resubmitted for consideration. Past winners are eligible to receive the award if they are nominated for a different accomplishment. The recipient will receive a decorative plaque from the Florida Chapter of The Wildlife Society.